Hello friends! 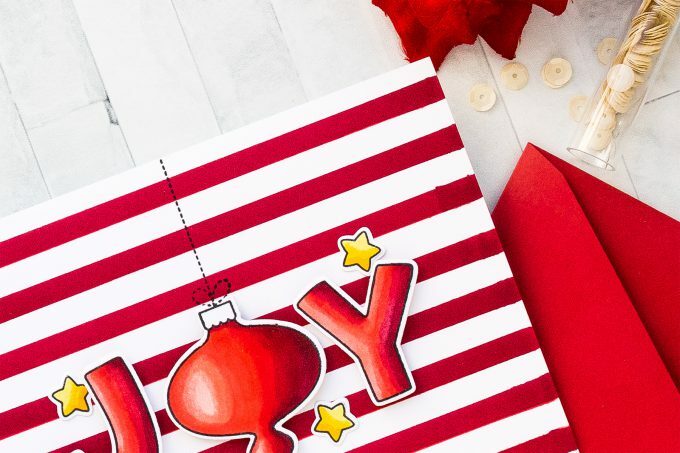 Christmas season will soon be upon us so it’s a good idea to start making these handmade Christmas cards early to avoid the stress during the season. Today I have a tutorial to show you how you can create stunning Holiday cards using a small number of cardmaking, stamping and coloring supplies (this is the time of the year when a lot of new people join cardmaking and try their hand at making handmade cards for the first time, so I wanted to share a video showing Holiday cards with a small number of supplies without breaking the bank). I do sometimes like to go overboard with my Holiday cards especially if I do a lot of die cutting and layering and my family love to receive those cards. My friends on the other hand prefer simpler & cleaner Holiday cards. 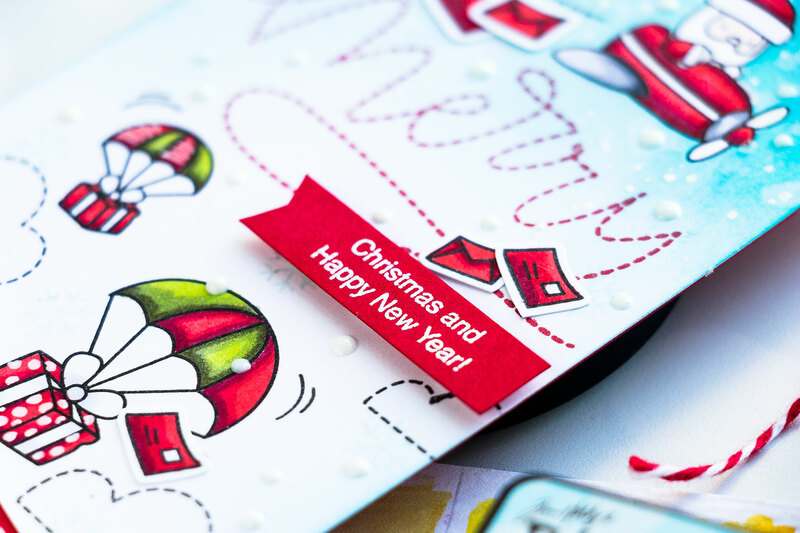 In today’s video I’ll show you an example of an easy to make Christmas card using using just a handful a things. Lately I believe that less is more and that’s the spirit or the motto of my cardmaking video today. I started making my card by creating a striped background. 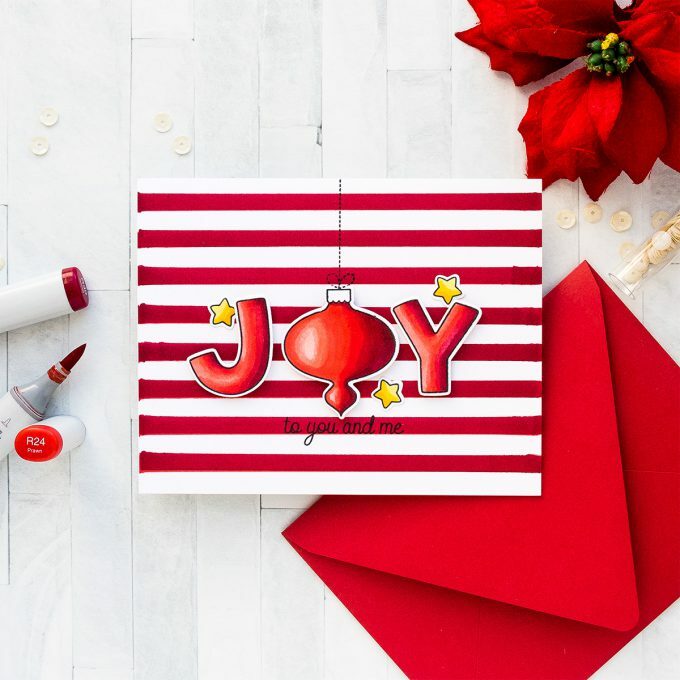 Stripes are always fitting for a Holiday card and a striped background is very easy to make. It’s super simple – all you need is a marker and a ruler. 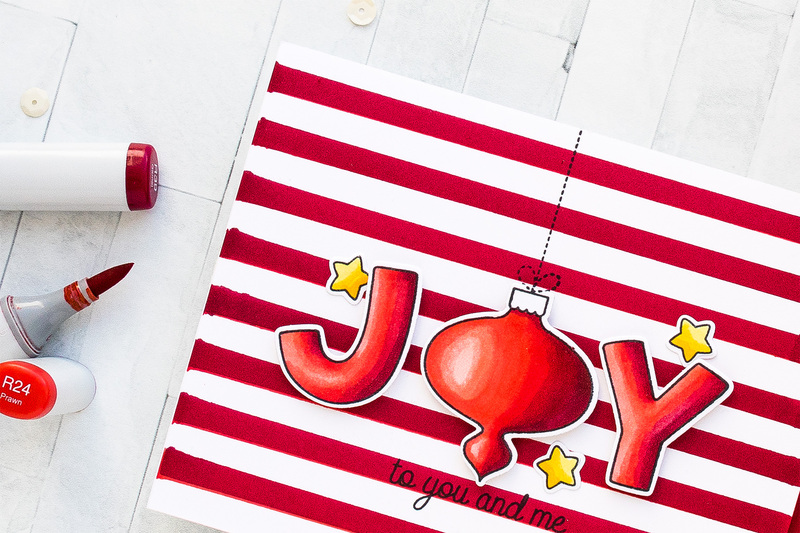 Of course you can always stamp a striped background, but less is more is the focus of this post & video so instead of stamping a background I wanted to show you how you can make one or a bunch of backgrounds yourself. Use some sort of grid under your panel (this can be either grid paper or the lid of your stamping tool if you have one; I would not do this on a cutting mat because marker will permanently stain it). Next, with the help of a ruler and chisel nib of a Copic marker (or any other marker) draw horizontal or vertical (or you can even go diagonal!) lines every 1/4″. You can decided to have wider lines if you like and space them differently if that’s what you prefer. I used R89 marker to create stripes for this card. 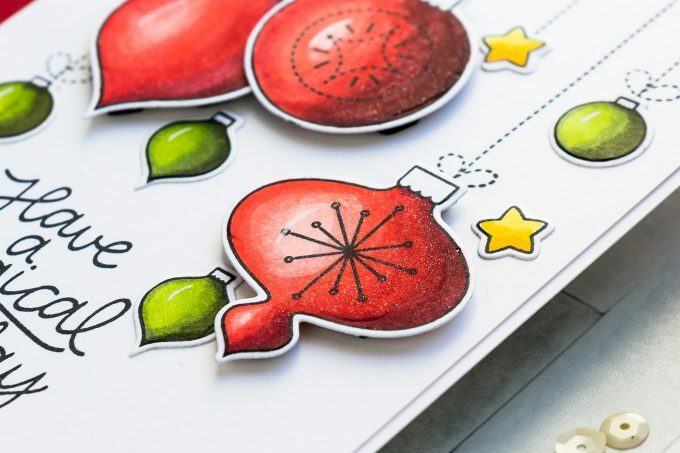 Next, I stamped ornaments using copic-marker friendly ink onto white paper and colored them using the following Copic marker colors: R89, R39, R27, R24, R22 and R20 to create lots of dimension, deep shadows and highlighted areas on my ornaments to help them appear dimensional. 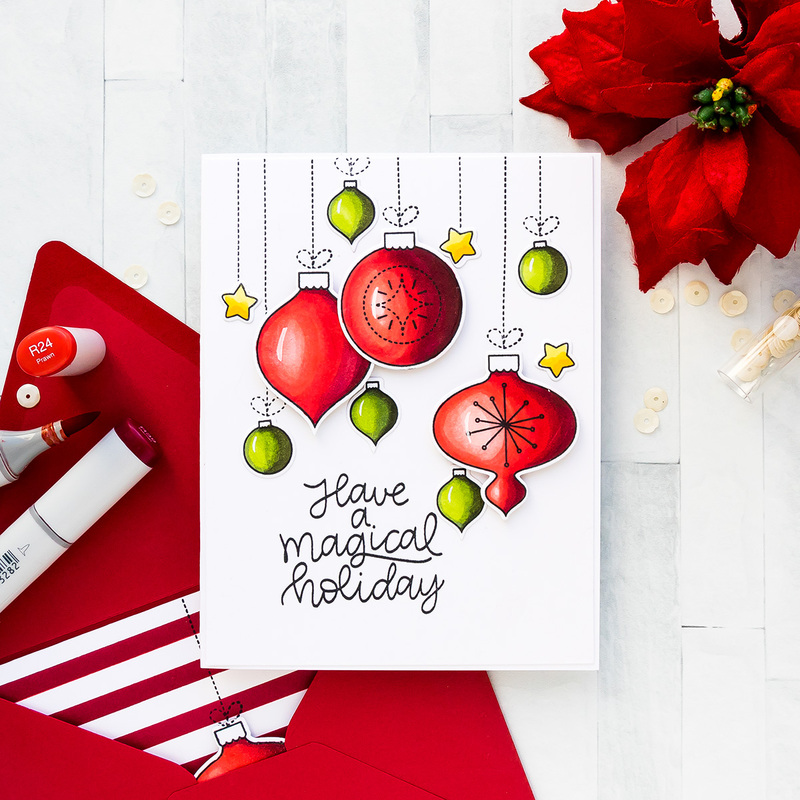 The light source for this card is coming from the left top side and thus the right side of my ornaments is the darkest – this is where I applied my shadows using the R89 and R39 markers. Next I’m used my transition shades the R27 and R24 to blend the shadows into a a circle highlight area that was colored using R22 and R20 markers to create an almost white like highlight on these. Once my coloring was done I used a Nuvo Aqua Shimmer pen to add a bunch of sparkle to these ornaments – this pen looks beautiful or darker papers and it really does shine here on these ornaments. There are coordinating dies available for these images so I cut mine out and foam mounted onto the card. I show a variation of this card on video with a Glossy coated finish – be sure to watch it for more tips. 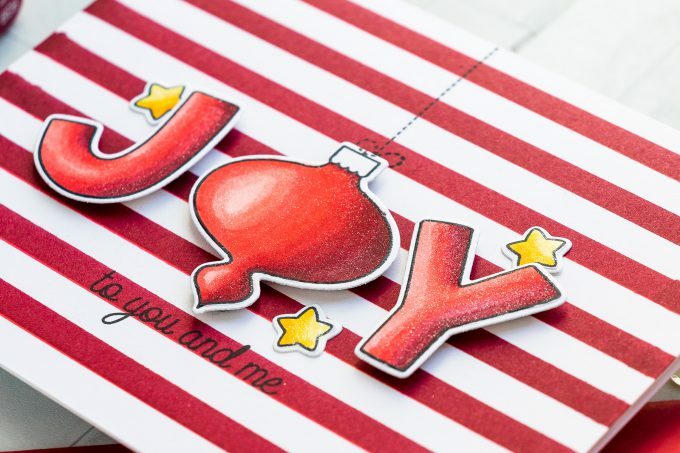 I foam mounted my ornaments to spell the word Joy on the striped background, stamped the ornament string and “to you and me” sentiment in black ink. Lastly, I added several colored and die-cut stars. I do have one more card idea using same stamp set and same supplies. 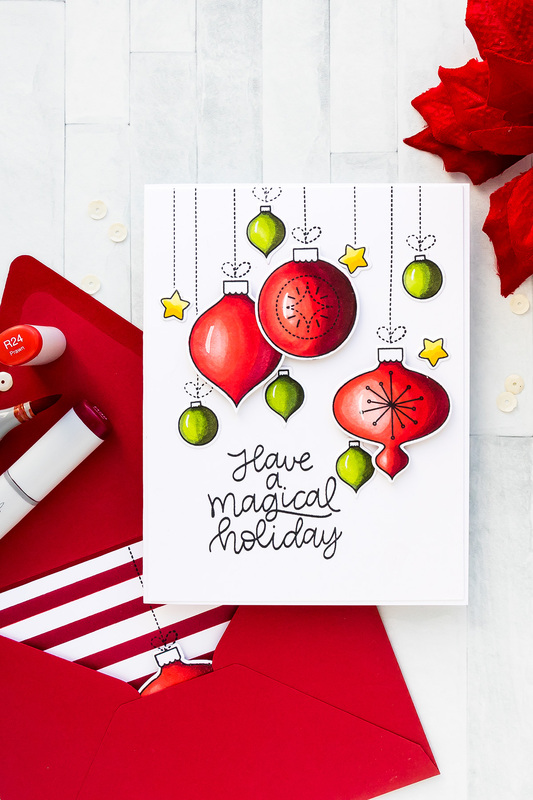 Here I also added smaller ornaments in green along with some beautiful hanging stars and stamped “Have a Magical Holiday” sentiment in black ink. Today is also the day Simon Says Stamp revealed Mama Elephant STAMPtember exclusive collaboration stamp set – isn’t it fun? Welcome to Mama Elephant’s #celebrating6years Anniversary Release Stampede with our wonderful crafty friends and designers! The wait is finally over! The release is now live and available for purchase in the shop! 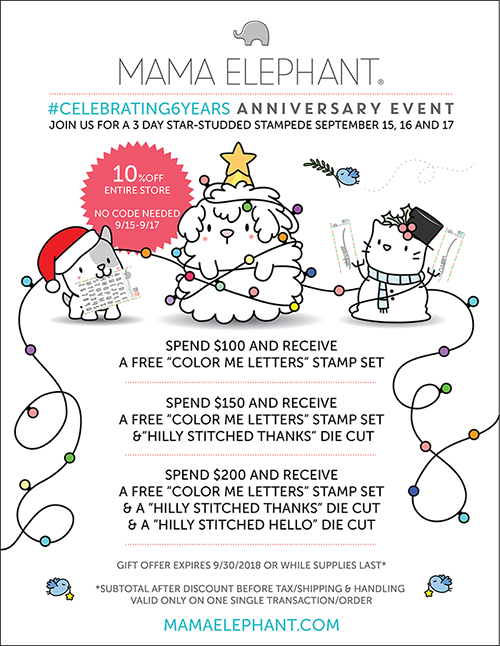 To celebrate with you, Mama Elephant has amazing sale and promotion and giveaway! Keep reading to the end! From 9/15 – 9/17: 10% off entire store! No code required! From 9/15 – 9/30: Spend $100* – receive 1 free ‘Color Me Letters’ 4×6 stamp set | Spend $150* – receive 1 free ‘Color Me Letters’ 4×6 stamp set and ‘Hilly THANKS’ dies | Spend $200* – receive 1 free ‘Color Me Letters’ 4×6 stamp set, ‘Hilly THANKS’ dies, and ‘Hilly HELLO’ dies. *Subtotal amount must be met before any shipping fees/tax/customs. Free item(s) valid only a single order/transaction. Limit one of each free offer per order. Orders cannot be combined. New orders only. Limit one free offer per customer/order. We reserve the right to cancel/modify orders. Free offer valid 9/15-9/30 or while supplies last! 1. Leave a comment on this blog post | 2. Like/share Mama Elephant on Facebook | 3. Follow/tweet Mama Elephant on Twitter | 4. Follow/comment Mama Elephant on Instagram. Each action qualifies for one entry, max 4 entries per stampeder please! AWESOME MEGA release, I love your cards, especially the less is more JOY card! Thanks for the video, and yes your cats are adorable! The scene you’ve created on the large gift tag is amazing. Always enjoy seeing your blog posts. I love this stamp set and what your created with it! Fantastic! 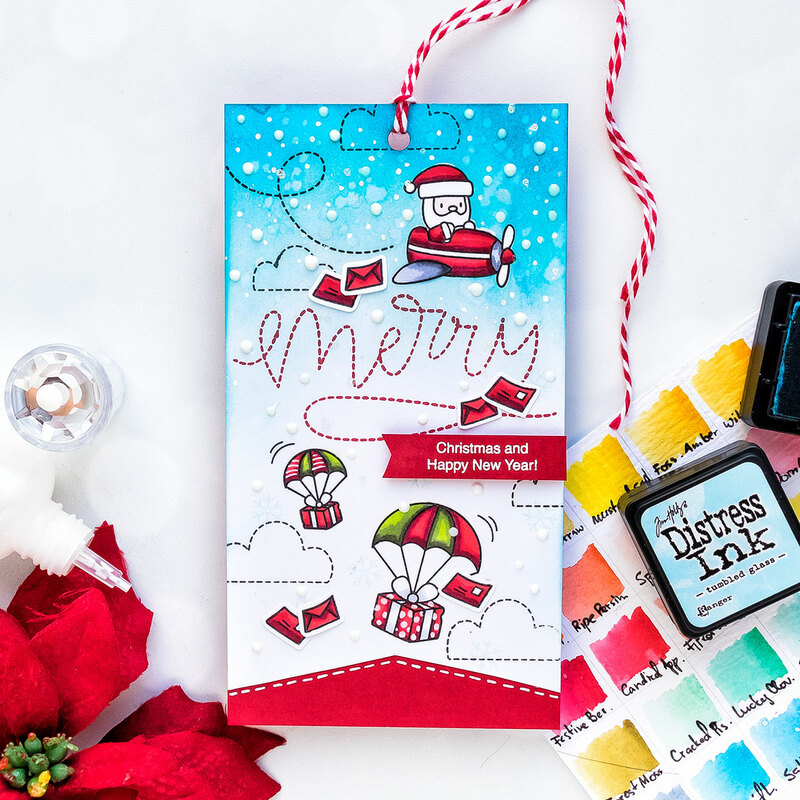 Both your cards and your tag are amazing and so adorable! 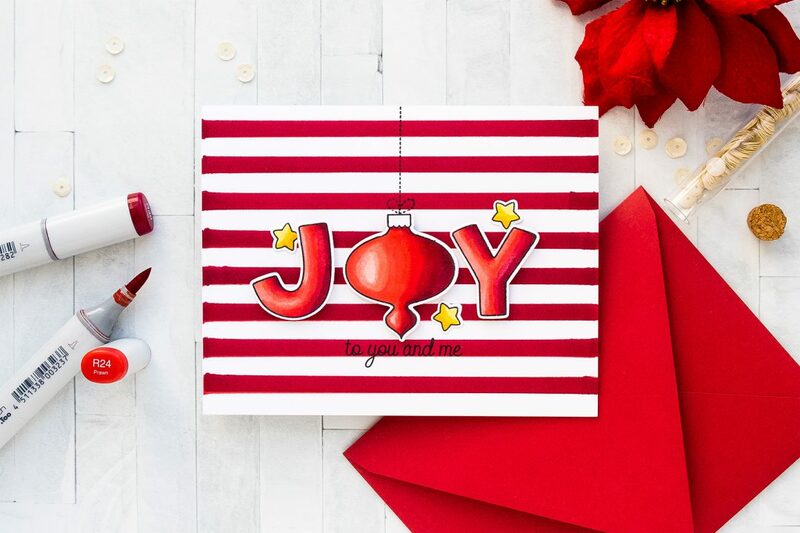 The bold red striped background you created for your first card looks fantastic! I love that you used such traditional Christmas colours. Always love your cards; there is an elegance to them. A very bright and vibrant, Christmas card. I never use the chisel end of my Copic markers so thanks for the tip on drawing stripes with them! Love your cards and tag! Fabulous cards…love the great tips on how to make a striped background. What stunning cards, I love to make the fast and easy cards, so I Make multiples to mail out. after all Christmas is my favorite time of year to make cards! thank you for sharing these beautiful cards. Your cards are amazing. 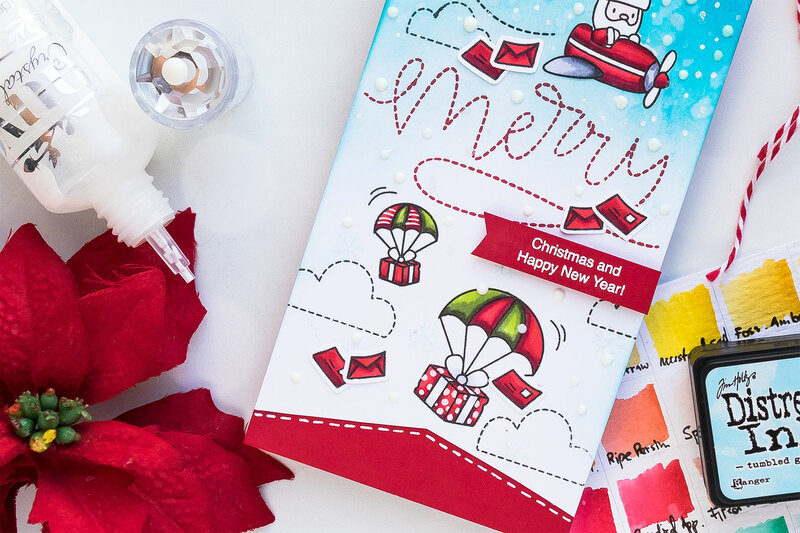 Love the bold red and white of your first card. I love your cards!!! your coloring is Awesome!! Your cards are beautiful- such a perfect example of how stunning “less is more” can be. Love those beautiful, rich colors! Fantastic cards! Your colouring is amazing to give such dimension to the ornaments! Love your makes on this release! I’ve never made an ornament card before, but your two ornament cards have changed that thought! I really like the font used on the sentiments in both ornament creations. 1. Oh my!!! Super super cute!!! Yana, I’ve never met a cat I don’t like! I really like your cards! Even though they are a design of “less is more”, there is still so much to look at & admire. Love the bold red. What striking cards you made. Love love love them both. Cannot wait to watch the video. Thank you, you are truly an inspiration! Beautiful cards. Love the clean simple look. I absolutely love your cards Yana! I actually started cardmaking around this time last year so I really do appreciate your approach to minimal supplies with these cards. They are stunning! Thank you for sharing! These are lovely! I like the simplicity of the cards and how you layered the ornaments on the second one. Gorgeous cards as always! Thanks for the great inspiration! Clean and simple done to perfection! Love you projects Yana, especially that first card with the simple background – what a great idea! So much to love with this Mama Elephant release and happy YOU are here to inspire us!! Live these fun cards! The ornaments are fabulous! You always make wonderful cards and I love the tips you give. Make your own background paper- so simple and easy-love it! Wow, I love how festive and bright your Joy ornament cards are! Such a great idea to make your own striped background. The tag using the Stamptember exclusive is adorable! Your kitties are so sweet. I have a black cat as well, and he is extremely spoiled! Your cards and tag are wonderful!! 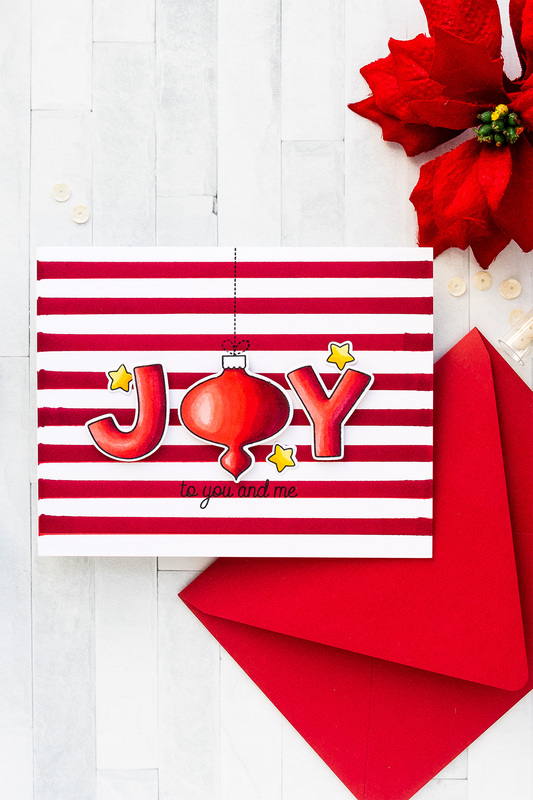 The joy christmas ornament set is so festive and the red striped background is a perfect match for those stamped images. 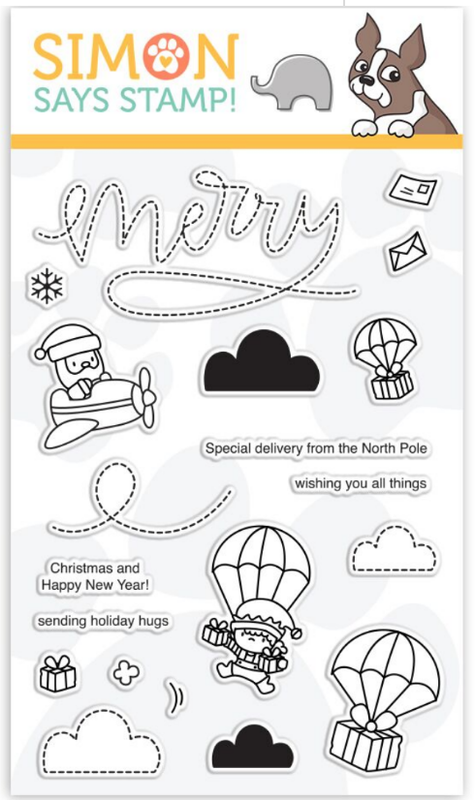 I adore the stamptember set with that merry trail that is left in the sky by the airplane. Your tag shows it off so well.